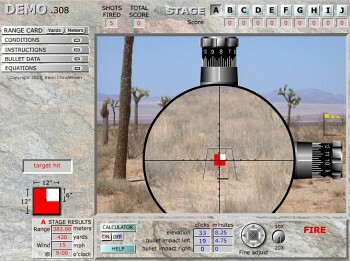 ShooterReady.com offers an excellent computer simulation that lets you “shoot” three different calibers at virtual ranges out to 2000 yards–complete with sound effects and realistic scenery. 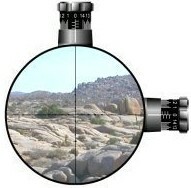 You view the target through a 10-20x zoom scope and adjust windage and elevation as with a real scope. A FREE Online Demo is available that lets you practice with a 175gr .308, and also Windrunner .338 and .50 BMG. Atmospheric conditions and range distance change with each stage, so there is plenty of challenge. Warning–if you’re at work, this can be addictive once you get the hang of it. You can practice Mil Dot ranging on 3 targets: A 12″ X 12″ swinging plate, a 30″ X 18″ knock-down plate, and a regulation 72″ X 19″ knock down plate. Each caliber has 70 range exercises, plus an advanced stage with 25 timed hold-offs, and moving targets. The CD also includes “Interactive Classrooms” that teach you how to use Mil-Dot scopes and how to use a range card. 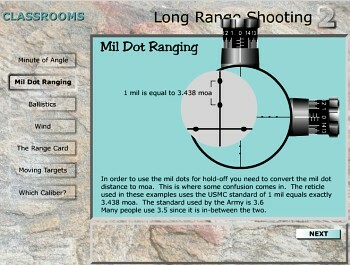 The presentation on reading Mils and calculating target distances is very well done. It is much easier to learn interactively than by just reading a static manual. Below is a screenshot from the Mil-Dot Ranging “Classroom”. Trust us, you can learn a great deal from the Free Demo. This is not just a shooter video game. The demo offers a variety of scenarios–enough to keep you occupied for quite some time. If you want to learn more, the full CD, with hundreds of scenarios, and five bonus stages, costs $39.95 from ShooterReady.com. Share the post "Long Range Shooting Simulation"
In conjunction with the 100th anniversary of the NRA National Rifle and Pistol Championships at Camp Perry, NRA President John C. Sigler (at right) is initiating a Competitive Shooting and National Championships Endowment. To donate to the NRA Competition Endowment, contact Frank Cerutti, Director of NRA Strategic Giving, at (703) 267-1571 or fcerutti@nrahq.org. Donations to some programs within this endowment may qualify as charitable gifts for tax purposes. Gifts may be made in cash, stocks or other assets, and pledged over time or as an estate gift. Share the post "NRA Starts Competition Endowment"